You are here: Home / EcoKids-Environment / Kids Bring Home the Message to Cool the Earth! 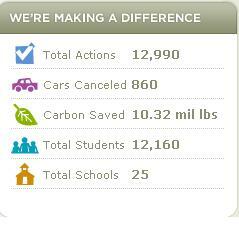 Nov. 24, 2013 Update, Cool the Earth.org fans! KIDS will soon be able to track THEIR own role in reducing their carbon footprint, not just with the fun kids carbon calculator, but with a show and tell, action-inducing Cool The Earth.org app that engages kids to inspire the whole family to take action and measure results hands-on. Slated for early 2014, (see demo after the jump) the Cool the Earth education app will guide children to connect the dots on the carbon footprint trail and help them make small changes in their own homes so they put their learning to use to SEE and BE the change. At Shaping Youth, we use a similar child-driven empowerment model for counter-marketing junk food, as kids ‘take home’ the message to parents in show-n-tell form…and ‘learn’ better choices from the kids. So what IS the Cool the Earth program? Part challenge, part game, part eco-literacy in a box, it’s a fresh, easy way to enable kids to ‘see the change’ firsthand, engage the entire family in reducing their carbon footprint, and learn the basics of climate change at a grassroots level. How cool is THAT? We’ve all learned the hard way that adapting kid-friendly programs into ‘core curriculum’ is a time sink, whereas schools easily embrace ‘enrichment,’ since it’s student and parent run, ‘apolitical,’ and takes place outside of the classroom with turnkey support materials all set and ready to run. It’s got such a universal appeal for all and so important to ‘get ’em while they’re young’ in terms of initiating positive ‘tread lightly to stand even a smidge of a chance in our ‘buy-buy-baby’ consumerist culture. Then the kids can take it from there, bringing home Cool the Earth influences for micro-change into every household! The screenshot at left is from a moment ago, boosted since my last check-in, so I can see how the kids would smile at the progress! I’m so excited about our similarities in aligned missions and methodology that we’ll probably end up partnering in some capacity. We both firmly believe KIDS can be the conduit for sustainable social change, and we both started as ‘one mom, one voice, one mission’ and we both are implementing cause-marketing via entertainment tactics to make the learning fun! Then, the parent-coordinator logs in the progress on the main website so kids get to see their ‘big picture’ impact contributing to the others partipating across the country as well…Love it! Scalable. Doable. Baby steps toward changing people’s stripes, as our partners at Green Zebra would say! Face it, jaded adults could use a boost of eager enthusiasm, often best recruited to learn these life skills by youth themselves…after all, kids will be around this planet longer than we will, so they’re not only the future stakeholders, they’re the promise for the planet. Remember the triplet teens that launched Polar Bear Nation? Case in point…Apathy and overwhelm is trumped by activation and doability! Since influence streams flow both ways between kids and adults, it makes sense that the action cycle spins both ways too. So whether it’s Cool the Earth imparting their nuggets of green, or Shaping Youth counter-marketing nuggets of processed junk food, I say we engage kids as catalysts for household change toward a holistic, healthier, more natural view of the earth as an inter-connected whole. What do you think? Do kids initiate change in your home? Do they influence your words, deeds and actions? An aerial survey by government scientists in Alaska’s Chukchi Sea this week found at least nine polar bears swimming in open water — with one at least 60 miles from shore — raising concern among wildlife experts about their survival. A World Wildlife Fund (WWF) polar bear expert said the bears could have difficulty making it safely to shore and risk drowning, particularly if a storm arises. The discovery of the nine bears at sea came as the U.S. Minerals Management Service was conducting marine surveys in the Beaufort and Chukchi Seas in advance of potential offshore oil development. WWF polar bear experts on the ground in Alaska are assessing the situation and will provide updates to the media as more details unfold. In May, the U.S. Department of Interior listed polar bears as threatened under the Endangered Species Act. Interior Secretary Dirk Kempthorne cited the strong body of science pointing to the significant loss of Arctic sea ice habitat as the primary reason for protecting the bear with federal legislation. The State of Alaska has opposed the listing and has sued the federal government over its decision to list the bear. Help save endangered species by stopping the proposed changes that will weaken the Endangered Species Act!!!!!!!! We’re building out something similar to Polar Bear Nation on our site Polar Bears Rock. However, we’re using flash games to engage kids to become aware about the polar bears. Thanks for this! You all should unite and cross-market! I think I’ll blog it over on Eco Child’s Play (Green Options Network) too…Another good offering is Dr. Tim Foresman’s ‘Last Little Polar Bear’ book to impart the scenario to kids in a hopeful way.. 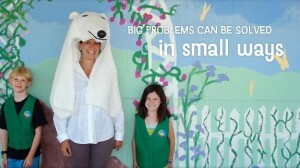 I see you’re linked in to the Polar Bears Int’l site with funding features…very cool Tamara…keep it up! I think this is a great idea to ge the kids involved in the community and to make them aware of their responsibility to the society. A great topic for our dinner group! Kudos for coming up with this! .-= heather´s last blog ..The Calendar that Saved a Friendship =-.